Cranberry (Vaccinium macrocarpon), also called Large cranberry, American Cranberry andBearberry, is a cranberry of the subgenus Oxycoccus and genus Vaccinium. It is native to North America (eastern Cananda, and eastern United States, south to North Carolina at high altitudes). 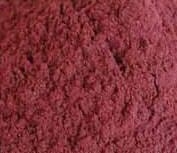 Cranberry Powder is an excellent colorant for a variety of cosmetic products, including blushers, eye shadow and lipstick, soap and many other cosmetics applications. The powder provides a rich red color and is naturally derived. I use this every year in my cold process cranberry soap, and even though it is only a seasonal soap I have people begging me for it year round! Even men love the gentle exfoliation from the cranberry powder. Not to mention, not many suppliers sell this product. Thanks TNS!